Solving problems! That is the motto of studying in the Netherlands. The difference between traditional learning and PBL (Dutch: Probleemgestuurd onderwijs) is ideally shown by the example of the mountaineer. An example, based on the educationalist Harald Riedel, clarifies what it is about. A mountaineer would like to climb a mountain. An experienced mountain guide explains the path and difficulties to him, he takes a map and compass - and off he goes. A different mountaineer would like to climb an unknown mountain. There is no path. It is not known what the ground is like, which slopes and crevices have to be conquered. During his preparations the mountaineer will brace himself for different obstacles and difficulties, factor in his experiences, as well as the experiences and the knowledge of his teachers, to discover a passable path. Traditional learning in schools and universities means that specific subject matter is predetermined: grasp the knowledge – master it – apply it. This way you have a stock of knowledge which can then be applied to i.e. tasks and problem solving at work. 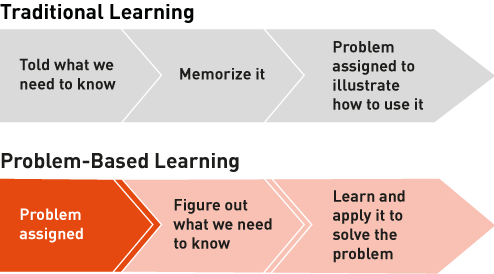 What does Problem-Based Learning mean? The starting point of problem-based learning however is the task I want to solve or the goal I want to reach. The knowledge of humanity is changing at a rapid pace! The same goes for the tasks our society faces. Time and again new problems arise for which there are no known solution processes yet. Here it makes sense to acquire the necessary knowledge during the task and problem-solving process and to connect knowledge domains. Here you need to first penetrate the problem and figure out what you need to know and be able to do to solve it. Distinguish essential and irrelevant things; find an approach; find out what is already known about this type of problem; examine causes and effects; consider side effects; set goals; conduct an approach to the problem, etc. Before the work group has found one or maybe even multiple solutions they will surely reach an impasse – and learn a lot from it! The same will happen in your occupational life, and that is generally how it is in our world which is changing rapidly. The lecturer will support the work group with their process.